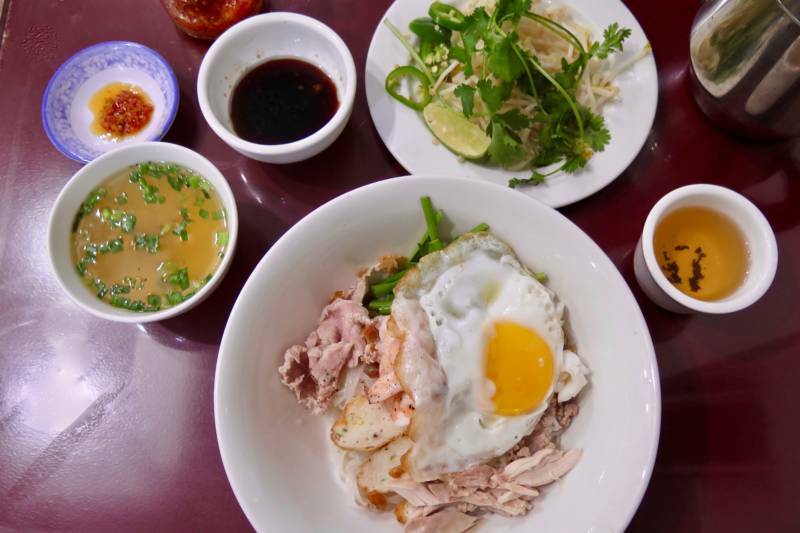 You don’t want to miss the #25 dry pho dish at Ha Nam Ninh in the Tenderloin, plan to dine out on October 17 for Food for Thought, try the Full English for brunch at Lord Stanley, and I have an epic prime rib special at Perle Wine Bar in Montclair for you to chase down. On the rare nights I haven’t booked myself up, or if I spontaneously find myself free for dinner and with no destination in mind, I love to play a little game. I’ll drive around a neighborhood, park wherever a space appears, and then pull up Google Maps and cross-reference Yelp and find somewhere new to eat. The other night, when an SF Heritage talk let out and I realized I had time to go get dinner, I found myself driving around the Tenderloin and Lower Nob Hill until a spot appeared on Larkin, and then I vectored in on Ha Nam Ninh. Review after review kept mentioning the #25 dry pho, so I knew what I was ordering. It’s a simple place, right on the corner of Larkin and Ellis, and has been open for four years (it used to be on Jones). At 8pm on a Friday, there were couples of all ages grabbing a bite, girls on their phones and giggling while eating pho, and some smaller groups sharing a meal. Throw in some Vietnamese TV and occasional yelling from the woman who runs the front of house to the kitchen (the night I was there, she was letting them have it) for extra entertainment. So, the #25. It’s under “Chicken Broth/Combination Soup” on the menu, and the name is Hu Tieu Nam Vang, a Southern Vietnamese noodle soup (“Nam Vang” is the Vietnamese word for Phnom Penh, the capital of Cambodia)—read more about the Chinese-Cambodian origins of this dish in this post on Viet World Kitchen. You’re going to order it dry, and be sure to ask for a fried egg with it. First, you’ll be served a fragrant bowl of chicken broth and a smaller bowl of dark and sweet soy sauce (AKA “the crack sauce,” as people refer to it online) and it’s going to haunt you—I tried to get an answer from them about what’s in it (twice!) and they won’t tell me. I asked if it has Maggi in it, but they swear it doesn’t. It has sweetness, a tang, a little heat, and hella umami. So much depth of flavor. It’s going to make you crazy trying to figure it out (well, at least me). Fortunately, I have a chef buddy who's going to reverse engineer it with me. I’m guessing there’s soy, sugar, fish sauce, chile, and Chinese black vinegar. Maybe they snuck in some MSG too. Whatever it is, this sauce is the secret star of the dish. You also get a plate of steamed bean sprouts, sliced jalapeños, lime, and cilantro (a typical pho side set-up). While waiting about 10 minutes for the main event to show up, I ended up sipping all my chicken broth, so I just asked for a second bowl once the noodles finally came out. This place doesn’t move quickly. The bowl contains vermicelli noodles, ground pork, shrimp, squid, shredded chicken, a delicious and springy fish cake, thin slices of pork, and some rather burly pieces of scallion that proved to be too much (I ended up taking about half out). You add some broth to soften up and loosen the noodles at the base. Then pour in some of the magic dark sauce. Add some bean sprouts, jalapeños, and cilantro to your taste, with a spritz of lime on top. Mix in that egg too. I also added in some of the bright garlic and chile hot sauce from a jar on the table—it’s a winner. It all comes together in such a satisfying and entertaining mix—each bite offers something different. I kept adding a little broth and the magic soy sauce as I went along, taking a sip of the broth too. The bowl disappears all too quickly. It’s $10.50 for a medium, and I was quite sated. Hungry eaters, you can request a large. And bring cash: this joint is cash only. 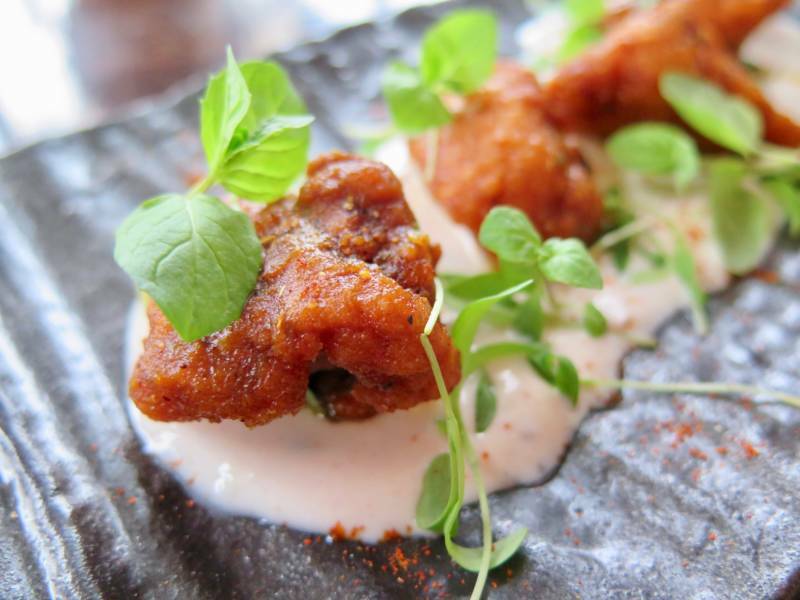 Coming up on Wednesday, October 17 is Food for Thought, when 20 Mission District restaurants band together and generously offer 25% of their proceeds to support after-school and college-access programs for Latino and immigrant youth. It’s a great night to get some friends together and go out for dinner. You can choose from longtime supporters Foreign Cinema, Destino, and Commonwealth, plus newcomers like Alba Ray's. Other spots you can dine and drink at are Asiento, Beretta, Doña Mago, Dosa, Emmy’s Spaghetti Shack, Evil Eye, Front Porch, Giordano Bros, Little Star Pizza, Loló, Mission Bowling Club, Mixt, Panchita’s #2, San Jalisco, Serpentine, and Uno Dos Tacos. There is also a raffle, and you can win amazing prizes (like an all-expenses-paid trip to San Miguel de Allende, Mexico, courtesy of House and House Architects)! Every $10 raffle ticket you purchase will be matched as a donation for college access. Help support Mission Graduates in their mission to helping to establish a college education as an expectation and goal for every child. Buen provecho! It sounds slightly scandalous to request the “Full English,” but it’s actually entirely proper. 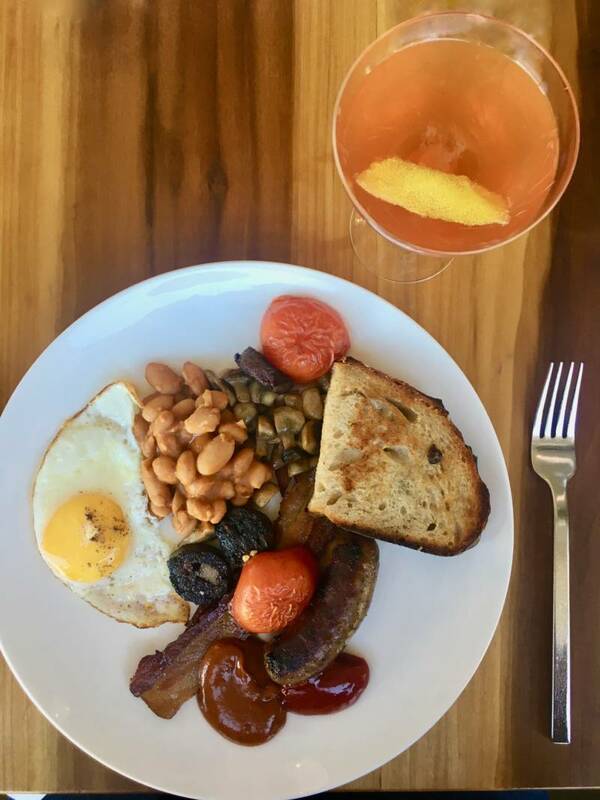 On Sunday, October 7, Lord Stanley in Russian Hill is bringing back their Sunday brunch dish, the Full English. You’ll be served a plate with perfectly fried eggs, roasted tomatoes and mushrooms, bacon, sausage, black pudding, beans, and toast, and, don't forget their savory brown sauce. You get the full plate for $25, and can also order mimosas, bloody beers, coffee, tea, and wine. Pinkies up! The Full English lineup is looking like October 7, November 11, December 2 and December 30. It's served 11am–2pm, and you can book a reservation. It’s a lovely dining room to enjoy during the day. Leave it to a chef obsessed with House of Prime Rib to create the ultimate homage dish at his own restaurant, and offer it at a deal. Chef (and full disclosure, good friend) Rob Lam of Perle Wine Bar in Montclair has created a prime rib Monday-night menu for $38 that includes your choice of onion soup, seasonal salad, or salmon toast (on thick-cut pan au lait), and your choice of prime rib or heirloom tomato Acquerello risotto with Mimolette cheese. So, about that prime rib. Chef Lam is using wagyu from Sakura Farms (it's so tender and pink and marbled), and he coats the roast in persillade (an herbaceous parsley paste with rosemary, tarragon, thyme, and salt). 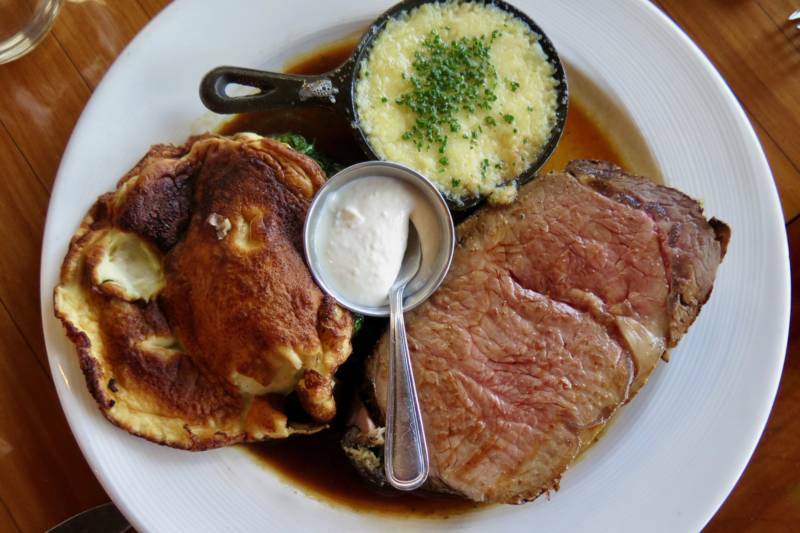 You also get sides of Robuchon potatoes (the creamiest and most decadent potatoes on the planet), creamed spinach, horseradish cream (with fresh-grated wasabi from Half Moon Bay Wasabi Company), and you’ll use the fluffy Yorkshire pudding (it’s like a popover disc) to mop up the au jus. Sorry, no spinning salad, but you’ll have plenty of cocktails and choice wines to choose from.